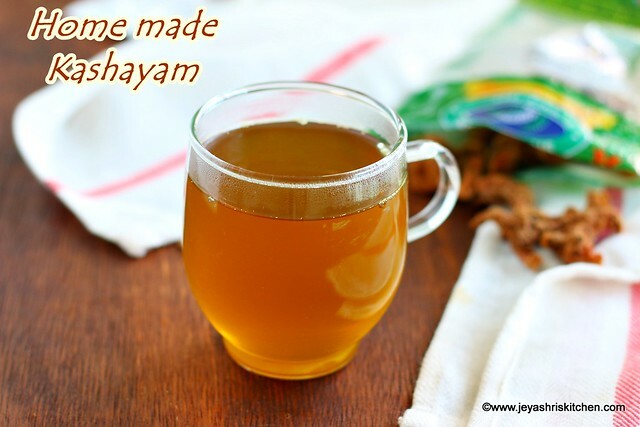 Kashayam for common cold and cough | கஷாயம் in tamil, with a video and step by step pictures, with clear explanations on how to make a Kashayam with easily available ingredients at home and home garden. Generally my mom never gives us any medicine for common cold and cough, as she always says it will last for a week and give us only home remedies. Being a nurse by profession, she never allow us to take medicine for common cold. Later when my kids started growing up i too followed the same practise. For the past few days me and husband are having cough and finally today i made a kashayam at home and i had some time at my disposal and so blogging it too. I am sure many homes follow different methods of kashayam, this is the common one we used to make at home. If you omit one or 2 ingredients also it is fine. I have given alternatives for that in the ingredient table itself. I got the chitarathai from Sri Murugan stores, Singapore. They have got wide range of nattu marundu products in their shop in small packets. We can store this in the refrigerator for later use. I always buy my monthly grocery from Sri murugan stores and they do home delivery too. We can also order through their Android or iOs mobile app. Description: Kashayam for common cold and cough | கஷாயம் in tamil, with a video and step by step pictures, with clear explanations on how to make a Kashayam with easily available ingredients at home and home garden. *Dry ginger powder - Can replace with a small piece of fresh ginger, crush slightly before use. **Fresh turmeric can be replaced with 1/4 tsp of turmeric powder. In a sauce pan add 2 cups of water and add the whole black pepper, cumin seeds, coriander seeds, ajwain leaves, betal leaves, chitarathai and dry ginger powder . If you want you can dry roast the coriander seeds for 2 minutes and then add to the water. I used home grown betel leaves and so it is quite small. So i used 2 small leaves. Add in the fresh turmeric, slightly crush before use. If using turmeric powder use it. Let this boil for 10 -12 minutes. Filter the mixture and using a spoon nicely squeeze the spice mixture. Discard the spice mixture as we extracted all the juice from it. Add palm sugar candy or honey to this and mix well. 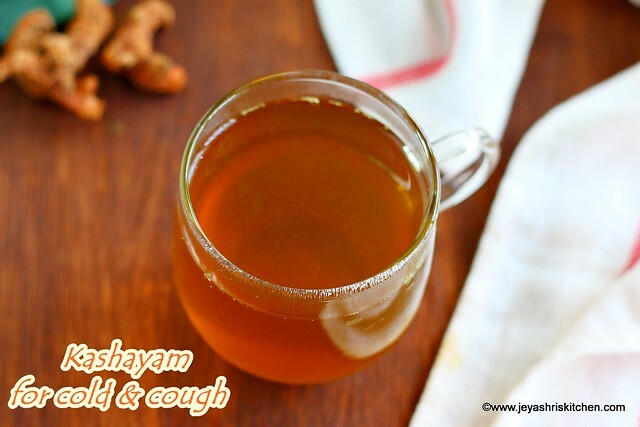 This kashayam soothes the throat and controls cough and cold. You can have this once a day, up to 5 days. If you don't get ajwain leaves, then add 1/2 tsp pf ajwain seeds| omam. I am not sure whether you can, give this for small kids but for above 10 year old kids you can definitely give this kashayam. 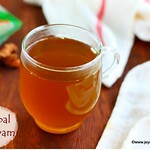 You can add a small stick of Cinnamon, Tulsi leaves to the the water while making Kashayam. In a sauce pan add 2 cups of water and add the whole black pepper, cumin seeds, coriander seeds, ajwain leaves, betal leaves, chitarathai and dry ginger powder. After seeing the health benefits of chittarathai, also called as Kulanjan in Hindi, i got mine from Sri Murugan stores, Singapore. You can add a small stick of Cinnamon,tulsi leaves to the the water while making Kashayam. My son is 7 yrs old & often gets cold and cough. Is this for dry cough or for wet cough? If so can i give continuous for 3 - 4 days?